Film archivists reasonably complain when rolls of film come to them for restoration and preservation that look like they’ve been through tornadoes. That goes for films about tornadoes, as much as any other, as the weather scientists and staff at the National Severe Storms Laboratory in Norman, Oklahoma, can relate. For 50 years they have been gathering film of the most inclement of weather conditions, and some of it is beginning to look decidedly gloomy. In an effort to brighten the outlook for the footage, they will use a conservation grant from the National Film Preservation Foundation that they received last month [June 2014]. Their footage is not all as pumped up as what you may have seen in movies like Twister and TV shows like Storm Chasers, but if it’s weather rather than risking your neck by driving into it that rocks your boat, it’ll do. As part of their quest to understand and better predict danger, the NSSL and its sibling agency, the U.S. Weather Bureau, both of which are under the direction of the National Oceanographic and Atmospheric Administration, have for five decades made, commissioned, or collected films and photographs of tornadoes, hurricanes, and other conspiracies of isobars and millibars that have beset American soil and shores. The last three decades of that visual data gathering have cost more than $5-million, by storm watchers’ estimates. And the value of the footage lies not only in casting severe storms in suitably dramatic light, but also in serving as a research resource for meteorologists who specialize in hugely powerful and destructive weather events. Museum curators and television production companies also treasure the footage, as do the millions of members of the general public from whom the weather draws at least as much attention as do the Kardashians. Unfortunately, say officials at the NSSL, nearly all of the historical film and images are on obsolete and rapidly disintegrating formats such as 16 mm film stacked in metal cases on storage room shelves. And that makes them essentially unusable to anyone who might want to view them. With their new preservation award, NSSL staff plan to restore, preserve, and share a portion of their one-of-a-kind historical films and photographs. Once converted to digital format and cataloged, the films and images will go up online with easy access for researchers, educators, and anyone else who might be interested in them. 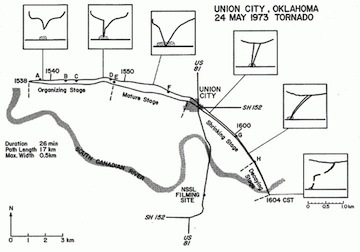 The NSSL will use its grant from the National Film Preservation Foundation, which is a federally established agency that raises and dispenses money for films the Librarian of Congress designates as culturally or historically essential, to preserve film of a tornado that tore through the small town of Union City, Okla., on 24 May 1973. NSSL will restore and convert 1,000 feet of 16mm film of the devastating Union City tornado. 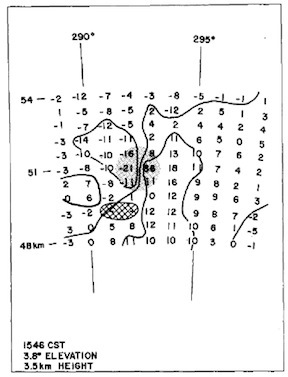 The agency explained in its application to the National Film Preservation Foundation that the tornado turned out to be a significant event in the development of weather radar and the history of severe weather research and forecasting. While researchers from the NOAA National Severe Storms Laboratory filmed the tornado, other researchers collected data on the storm using experimental Doppler radar. When they were able to process the radar data and compare it with the time-stamped photos and movies, they discovered a pattern now known as the Tornadic Vortex Signature, and that revolutionized the National Weather Service’s ability to issue timely warnings of approaching tornado activity. NSSL has the only footage that provided this lifesaving knowledge. The grant will permit it to store the original film securely after making digital copies that can readily be shared through the Lab’s website with download from a site that provides ready access to “b-roll” footage to anyone who has a use for it. The film is 16mm polyester silent color stock, and while it has been stored in metal canisters in office filing cabinets at normal room temperature with low humidity, the restoration company ColorLab has indicated it has some dye fade, a common outcome of spontaneous chemical changes in the image dyes of color film. Another problem for storm lab officials is that they no longer has equipment that plays the film, so are not exactly sure what it holds beyond a general description provided by labels affixed at the time. NSSL officials say that sharing the film with the public as with National Weather Service forecasters and federal, university, and private-sector partners will serve to improve understanding of severe weather processes and that that will also lead to better weather-observation technology and forecast tools related to weather radar, hydrometeorology, and forecast and warning systems. Little if any of the NSSL footage was recorded with the trailing film crews that now often capture the heroic efforts of “storm trackers” in response to public fascination with tornadoes and other severe weather phenomena. That fascination drove the production in 1996 of Twister, the film that Jan de Bont made for producers Steven Spielberg and Kathleen Kennedy. It grossed over $495-million on an investment of an estimated $92-million, and for what verisimilitude it had, can thank researchers at the National Severe Storms Laboratory in Norman, Oklahoma, whose work the filmmakers credited with inspiring their film, and who advised de Bont and company on the science and phenomena of weather and on what kinds of statements storm trackers likely might utter. 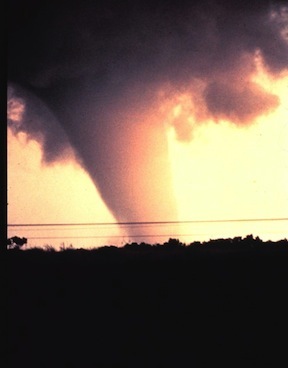 The wife-husband writing team of Anne-Marie Martin and Michael Crichton originally set out to create a script that focused on NSSL and University of Oklahoma researchers’ attempts in the early 1980’s to gather storm data using a 55-gallon drum flung into the maw of tornados. 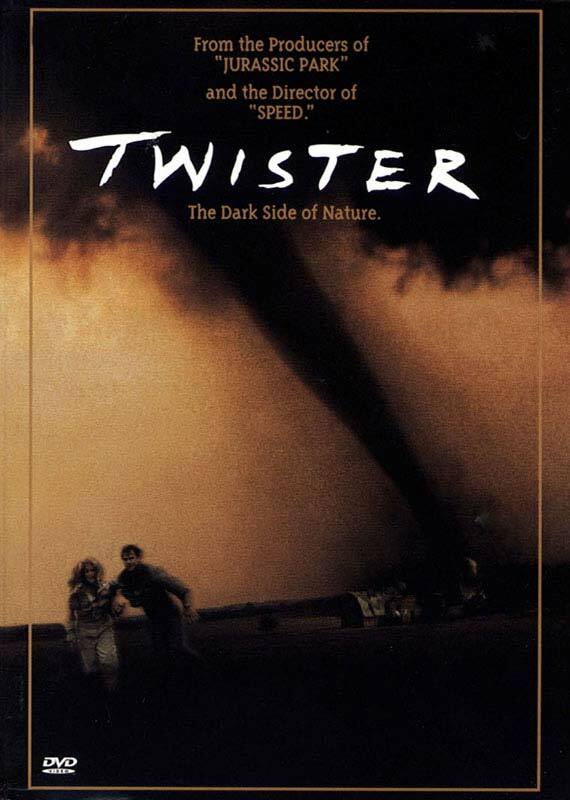 But by the time Crichton, Martin, and script doctors Joss Whedon and Steven Zaillian emerged with a screenplay for Twister, they had opted for more vocal vessels: squalling divorce-bound storm chasers played by Bill Paxton and Helen Hunt whose relations parallel those of surging atmosphere and pummeled land. That was not, by the way, a real cow flung aloft by the Twister storms, but rather one refashioned from a CGI zebra created for the 1995 feature film, Jumanji. As for the moaning of the tornado, that was created by slowing a recording of a plaintive camel.